The brilliance of VIVID will return to shine the spotlight on Sydney from 25th May 2018. VIVID 2018 is sure to delight, captivate and enthral us for 23 exciting days and nights once again this year. In 2018, VIVID is celebrating ten years of creativity and innovation through their Light, Music and Ideas programs. 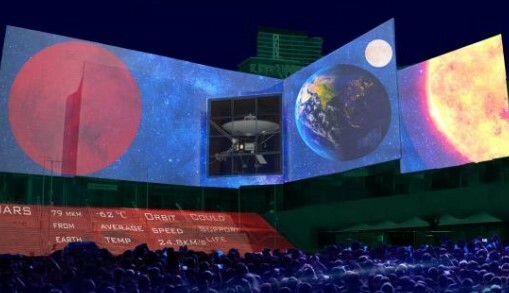 In that short period of time, VIVID has become Australia's largest event, attracting 2.33 million people last year, and is an important fixture on the cultural and tourism program of the city. The sails of the Sydney Opera House will come alive under the creative direction of Australian artist Jonathan Zawada, in his work titled Metamathemagical. The artist explores metaphysical themes using imagery inspired by the Australian environment. 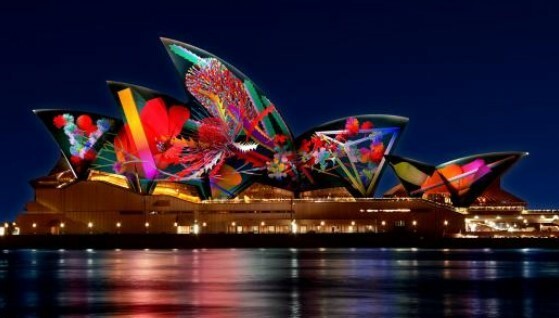 You can expect a bold use of colour and geometric designs in his digital sculptures and compositions which will be projected on to the sails of the Opera House. There is also a synchronised lighting display on the harbour, designed by 32 Hundred Lighting, which uses satellite navigation to coordinate lighting changes so that each participating vessel becomes part of the display. Some good places to view the harbour lights include Circular Quay, The Rocks, Bradfield Park (under the Harbour Bridge at North Sydney), Luna Park, Lavender Bay, or on the harbour itself. The lights come on nightly at 6pm and end at 11pm. Around Circular Quay there are VIVID installations at Customs House, which will feature our favourite gumnut babies, Snugglepot and Cuddlepie, to celebrate 100 years of this classic Australian story. The Museum of Contemporary Art is showcasing a light and sound show titled Virtual Vibration and other Circular Quay installations include Living Lights by the University of Technology Sydney and Synergy by Create NSW Inc.
EORA - Dark Emu combines Aboriginal history, art, dance and architecture in a large-scale projection on the Southern Pylon of the Sydney Harbour Bridge. 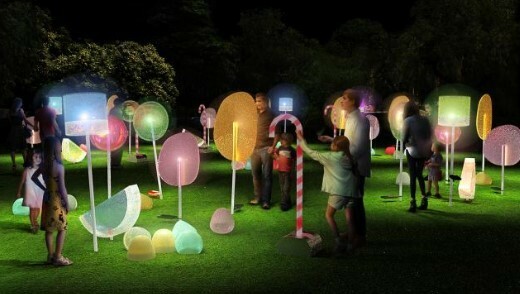 At First Fleet Park (next to the Museum of Contemporary Art ), children will love visiting The Garden of Sweeties, a fun way of presenting renewable energy sources to a young audience. Another interactive work for the young and young at heart is Wobbelees, four oversized toys that wobble from side to side, change colour as they move, and chime before returning themselves to an upright position. Cadmans Cottage in The Rocks will be transformed into a virtual BALLpit, while Mystery Gateau by Masterchef Australia will light up the façade of the ASN Co. Building. Harmony Valley - Rainbow of Peace & Trees of Friendship is an interactive installation which uses inflatable "kawaii" sculptures and a soundscape to immerse participants in a world of belonging and humanity. 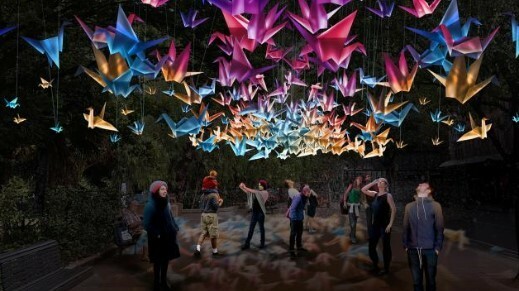 1000 Cranes is inspired by the Japanese senbazuru legend and the story of Sadako, and invites visitors to walk under a canopy of one thousand hanging origami cranes. The birds light up as you move through the space, with the aim of bringing good luck and hope to all. 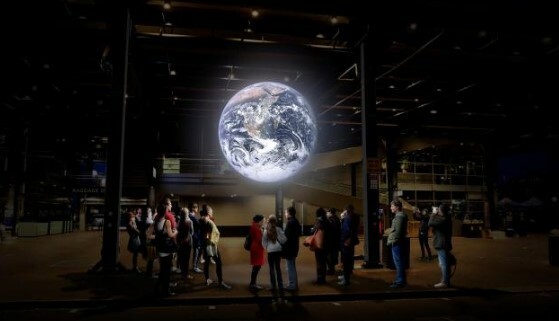 In the Overseas Passenger Terminal, you will find Earth. This work uses NASA imagery of the Earth's surface and a cosmic soundscape to provide visitors with an astronautical view of the planet. Prepare yourselves for an exciting and interactive journey through a nocturnal environment of artworks which have been inspired by nature when you visit VIVID at The Royal Botanic Garden Sydney. The best entry is via the QEII gates near the Opera House forecourt. Wander through The Nautilus Forest, made up of 24 colourful and illuminated spiralling trees, or pose for a photo in the centre of a giant, electric metallic flower in The Bloom. You can have the sensation of riding a wave in the He'e nalu installation, or become immersed in the interactive light and sound installation of Parrot Party. The flock of brightly painted, frosted plastic birds become happy and excited when they draw a crowd, bursting into song and radiating light. Inspired by many shell middens found during the excavation of the Barangaroo site, Nacre is an assemblage in the shape of a seashell which honours the Aboriginal people and highlights the sustainable practices they used to protect the environment. 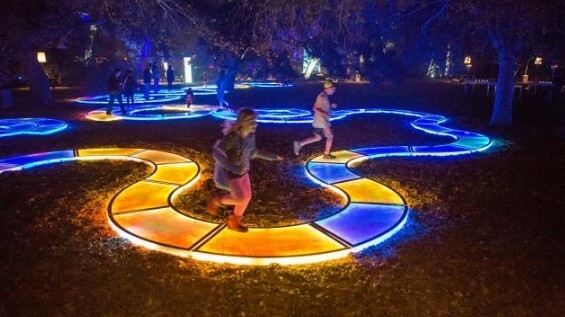 Located near Government House you will come across Aqueous, an interactive landscape of meandering pathways of light. The colours and lights will react as you step, jump, hop or run along the pathway. Other works within the Royal Botanic Gardens include: Midnight Moon, Ember, Oasis, Midnight Sun, Hyperweb, Impressions, Rejuvenate, Wish Happiness and The Bower. 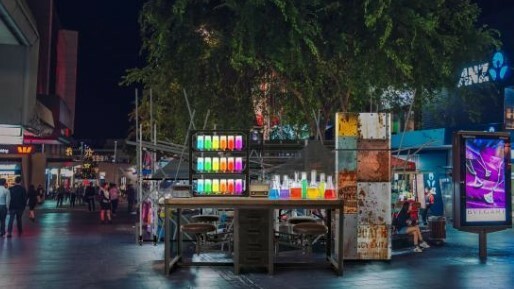 VIVID installations will extend to various locations in the city. Check the VIVID website for further details regarding the locations of the following installations: Closer, Focus, Square Figure, Astral, Visible Dynamics, Chrysalis, Timekeeper, Fragmented, Come Fly with Me and The Space Arena. 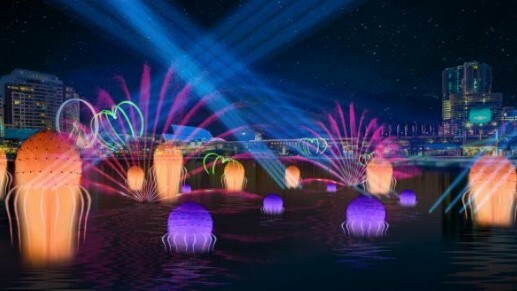 Along Wulugul Walk, Barangaroo you will be welcomed by a giant luminescent puppet who will walk with you along the waterfront in a brilliant and theatrical display of light and sound. 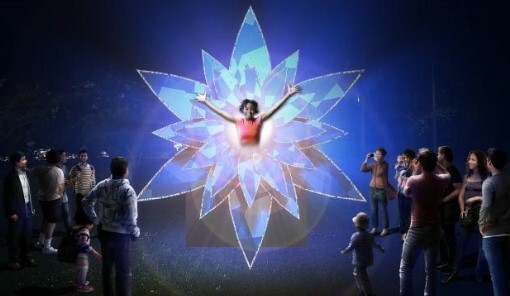 Lights, lasers and water fountains are on the VIVID menu at Cockle Bay in Darling Harbour this year as you experience a dream-like dive into the depths of the ocean in Fantastic Oceans. While on the other side of Darling Harbour, over at the Australian National Maritime Museum, Sir David Attenborough's Blue Planet II will be projected on to the rooftop of the museum. Luna Park joins the VIVID party this year with the Ferris Wheel lighting up, plus the iconic façade of Coney Island will be illuminated with large-scale projections. Taronga Zoo will host Lights for the Wild where you can see fascinating animal light sculptures and learn about how Taronga is working to help save ten species from extinction over the next ten years. There are limited tickets available for each night. You can register for ticket updates by clicking here. The Coca-Cola sign, World Bar and the Kings Cross Hotel will be joining the VIVID party in 2018. For more information please click here. In Chatswood Mall, you will find Light Market, consisting of market stalls built from recycled materials and hosting food from all corners of the world. Brave souls can test themselves against a lie detector with a difference. Liquid Lies located within the Light Market invites participants to answer three simple questions with the lie detector delivering a flavoured drink accordingly - there will be sweet treats for truth tellers and sour sludge for the rest. While you are there take the time to have a chat with a chair, yes literally. In the I Have Feelings Too installation benches throughout the mall will include sensors that activate when sat on to tell you how they feel. 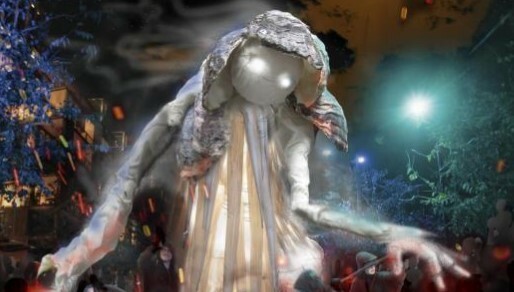 If you venture into Hawker Lane you will be greeted by The Octopoda, a steampunk-inspired, robotic and musical, octopus. At the Chatswood Interchange, the Skyportal is an interactive video experience promising to transport you to an alternate reality. To view the full VIVID 2018 Program, please click here. For information regarding transport and road closures during VIVID, please click here. Now in its 10th year, the installations at VIVID get bigger and better every year, and not surprisingly, so do the crowds. With over 2.3 million people attending the festival last year, it makes sense to plan your visit before you go. Happily, the Vivid Sydney App will keep you up-to-date and help you get around the various precincts and installations. It is free to download from the App Store or Google Play Store. VIVID Sydney is owned and managed by Destination NSW. good tips thanks postcards ... these are amazing photos, did you take them all?